The Floating Empire: And a new fire pit. . . .
And a new fire pit. . . . 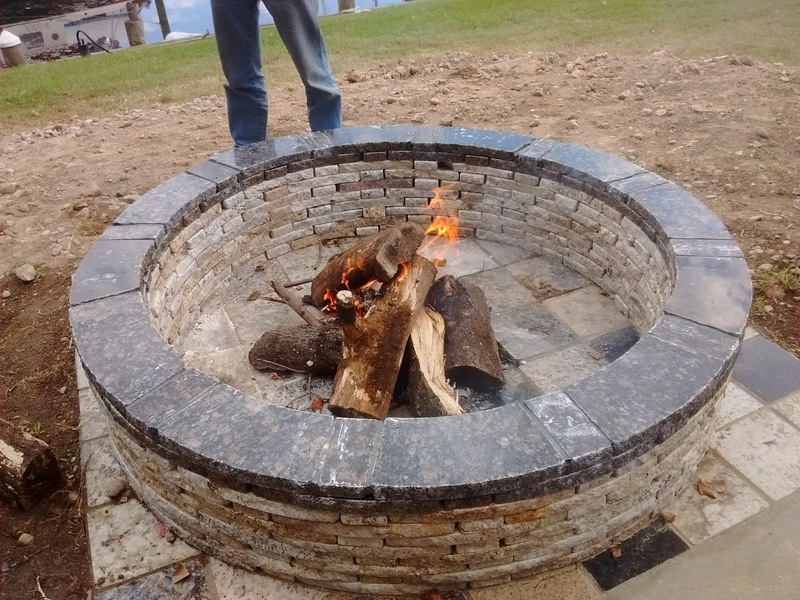 The Marina's new marble fire ring: first fire. You may recall one of our earlier posts (including some rather scary video) was of the installation of a fire pit here at the marina (see here). Well the thing worked just fine, and was covered with some lovely ceramic work. . . until some pack of drunks (we never figured out who did this) made a fire in the thing that was so hot it exploded the bricks, shattered the tile, and cracked the concrete. We (and the Marina staff) were unamused. So the poor thing sat there most of the summer covered over. Tom searched around and managed to find a company up in PA that recycles marble countertops into fire rings. So we bulldozed the old one and assembled the new one in a better spot and, last evening, lit our first fire of the season. Fall is in full swing here, with a couple of days of chilly temps and wind. The woodstove is working well and we'll be doing a followup on that shortly, but today the temps were back up into the high 60's, and the sun was out. I've come to love this time of year. 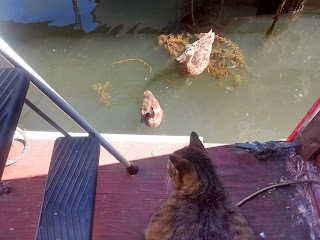 Our pair of beggar ducks have come by the boat wanting to be fed so often, the cat no longer cares. Yeah, they're ducks. So what? Where's my cat food? The trees are going into full color, the crab are still running but the oysters are in and wonderful, bald eagles have replaced the Ospreys patroling the river, and we're having a lovely time here on the water. More stuff at Life, Art, Water, check it out. Good to hear that you've got a new fire ring. It looks really good. For you, this time of year may be nice, but for us in the PNW, it is nice up until the rain sets in and then it is cold, dark, and wet until May. If it wasn't so green here year round, I'm pretty sure I would have left before now. As one Oregonian said, "I feel bad for the Irish: they only have 184 shades of green."